Depot This 2nd depot is just to left of word "Depot". 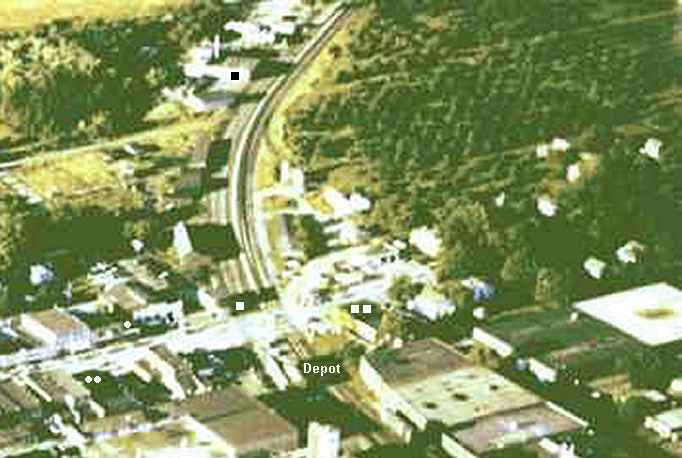 See the 1st Depot. There is no depot now. This is Moscowitz 5 and 10 store. The next store the left is Robert Warren Clothing. Three doors to the right, a 2 story building was Clouse Grocery & Cold Meats where my class mate Ann lived with her parents Ray and Lula. Across the street, is the Pool Hall. Tabor Drug Store is just to it's left and Rosenow Garage is to the right, also being the Allis-Chalmers Dealer. This is the Farm Bureau. The next building north along this West RR Siding is their Ware House. This is the Steven's Hotel. The next building, right, under tree is Doc. Coxford's Dental Office. North, on East RR Siding are two tall tanks, being the Standard Oil Bulk Storage. and Pickle's that are salted in big tanks outside. This was managed by Keith Hutchins, my Uncle. I worked here on a couple occasions, Vinegar oder is hard to work in.